The term conjures up images of sleepless nights, toddler tantrums, unexpected precious moments and overwhelming feelings of absolute frustration mixed with love – often at the same time. On Mother’s Day (and all the other days) being a mum (or dad) isn’t easy; it also isn’t a strictly human experience; many other mammals “mother” their young and often have similar moments of sweetness, determination and frustration. How do we know? Our wildlife monitoring program cams show us so. You see, we set up cameras at wildlife overpasses and underpasses to see how animals are using them. It helps us get a sense of what’s working and what we can improve on. We recently captured some wonderful footage of wildlife mumma’s teaching their youngsters how to use these important routes for their own safety and survival. So to all the mothers out there, trying your hardest to stay the course and do the right thing, this is for you. So – Happy Mother’s Day! No one said motherhood would be easy, but who knew it could be so darn cute? Do you have any questions about this or any other work the Ministry of Transportation and Infrastructure does? Let us know in the comments below. 9 Responses to What Does Mother’s Day Look Like in a BC Wildlife Underpass? How many wildlife underpasses are there between the Okanagan,Kelowna area and Hope through highway 97C and the Coquihala? We support the Ministry of Environment’s human/wildlife conflict reduction efforts, and that ministry shares information about the locations of its wildlife crossing structures on a need-to-know only basis. The ministry wants to avoid humans encountering wildlife in its wildlife crossing structures. Encountering a wild animal on, or in, a wildlife crossing structure could result in a very unpleasant, life-changing experience for both humans and wild animals. For example, humans don’t typically fare well when they run into bears or cougars in confined areas. Wild animals known to attack people are tracked down and put down by Conservation Officers to protect other people. Hi there – for some reason I’m only seeing one of the mother’s day animal underpass photos, I wonder why. Would really like to see the other photos if possible. I am checking into this. Did you receive these blog via an RSS feed? You should be seeing three videos, as well as the photo of the deer at the top of the page. 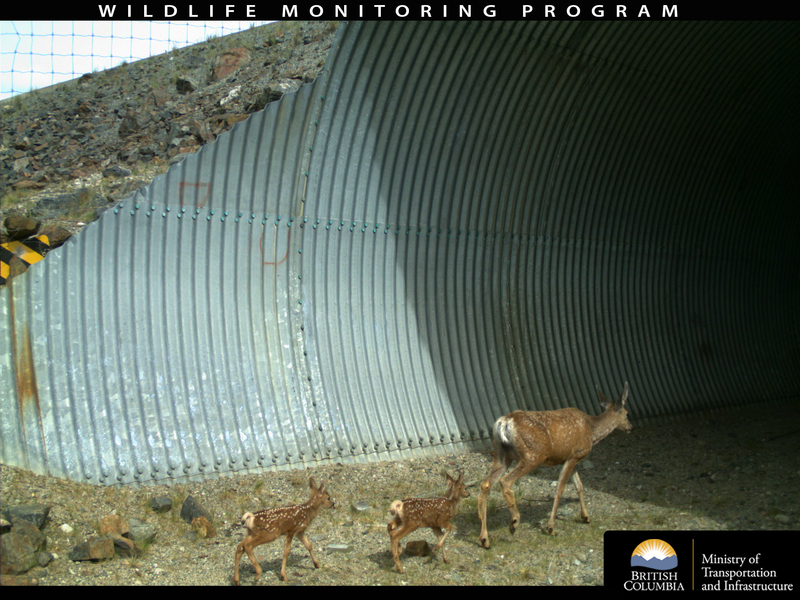 Perhaps try this link again: https://www.tranbc.ca/2018/05/09/what-does-mothers-day-look-like-in-a-bc-wildlife-underpass/ (without using the RSS link). We’re having issues with our site, which we’ll be addressing soon when we do some updates to TranBC. In the meantime, we have inserted direct links to the videos which are on YouTube. Three times you will see “[Can’t see video? Click here]”. Click on the links and they will take you to videos of Moose Mumma, bears and deer. Our apologies for this situation. thank you – I see them now (with the can’t see video, click here) – so cute ! !